lol this post is hilarious, but sadly needed. I love seeing pitt bull/pittbull. 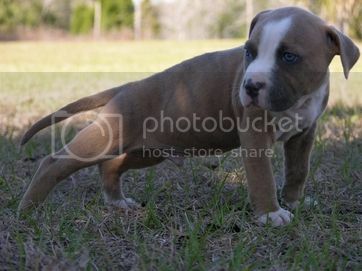 And people selling "gatormouth/bluenose" puppies on Craigslist. tsktsktsk. I have had Zeus called "gator, red nose etc." He's my buddy and I'd be lonely without him. I'm new to the site. I look forward to talking with everyone. Any tips on maneuvering the site? I got my avatar and put some pics in the gallery...hope everyone checks them out. Zeus is a hoot!!! Don't forget the American Staffordshire Terrier! The show line of APBTs! Had a buddy who saved their dog from BSL by having a breeder friend with a vet husband testify that their harmless pooch was an AmStaff, not APBT... Such craziness for a dog that's almost the exact same genetics! It's not a show line. It's a separate breed. It was originally created as a show line but over time it became an entirely separate breed with a different appearance and temperament. Dog shouldn't have needed to be "saved" from BSL to begin with. If the dogs are banned, abide by the law and don't keep dogs of that type inside that municipality. People need to stop trying to circumvent BSL illegally because it's never going to end well. why own one if you so adamantly hate their past? I know this may make sound incredibly nit picky... But you know that APBT were never breed to kill rats in a pit? They are far too big to be effective rat killers, considering that the whole point of rat pits were to kill as many as 100 rats as quickly as possibly. Have a look at a Rat Terrier or a Jack Russel Terrier. They are far better designed to effectively kill rats. I grew up with a dog that was a mix of a JRT and a Fox Terrier, and I saw that thing kills rats and snakes. I have yet to see a dog with such a high prey drive. She was a tiny little vermin killing machine. I love this thread i just joined this forum. i actually work at a small locally owned pet store (we do not sell animals) one of my biggest pet peeves is people saying they have 120 lb pit bulls and I'm like um no! education is important to me. your the first thing i have read and posted. thank you for this. APBT isn't the only type of "Pit Bull" I hate that the first post I read is such a judgey one. Especially since our breeds are the most judged breed of all. Who cares what people call them as long as they love then and treat them with respect??? I do.... if your mutt bites someone I don't want it called an American pit bull terrier. Yes, it is.. That is where the name "Pit Bull" Came from, just easier to say than "American PIT BULL Terrier", like most people call Labrador Retrievers "Labs" or "Irish Springer Spaniel" Springers. There is no other breed with "Pit Bull" in their name. Breeds mistakenly called Pit Bulls by ignorant people are their own breeds, Like American Staffordshire Terriers, American Bullies, Staffordshire Bull Terriers - you ask a fancier of those breeds who is educated and they will tell you all about their animals and their breed, and if you ask it - that they are not APBTs, it is a completely separate breed. Like Comparing Cocker Spaniels to a Cavalier King Charles Spaniel, both have medium soft coats, big full drop ears, big eyes, and soft (sometimes wrinkled) faces. They're both Spaniels, and entirely different breeds. I am new here and I have a question. Is APBT ok to use if the pup isn't registered? I just adopted to beautiful little men, 7 weeks. Personally I'm against it, you don't know the dog is a purebred APBT. Like calling a Lab mix a "Labrador Retriever," you're implying the dog is a specific breed. My dog isn't registered either, I call her dog a Bully breed mix or Pit mutt because it's more honest IMO. So I guess calling my dog a pit bull mix is ok then. I adopted my boy from the local shelter here in San Diego and they identified him as a pit bull/beagle mix. I'll post a pic of him soon but he's not part beagle, looks more like part pit bull/sharpei.